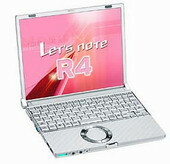 The Panasonic R4 is the smallest and lightest notebook of Panasonic’s Let’s Note lineup. Weighing only 2.2lb, Panasonic R4 laptop is also one of the lightest notebooks on the market. The prior model, the R3, was recently updated to the R4. The update included moving to a 1.2 GHz Pentium M processor, the more recent 915GM Intel Chipset, and upgrading to DDR2 ram. Besides the R4 badge, the units casing remained the same. The unit also features an extra long 9 hour claimed battery life. This entry was posted on Sunday, September 4th, 2005 at 9:16 am	and is filed under Laptops. You can follow any responses to this entry through the RSS 2.0 feed. You can leave a response, or trackback from your own site.